Curry? What do you understand by the meaning of curry and do you know where the name curry comes from. In this short article Majnu Malhi explains the roots of curry and how curry has come to hold the place it does in modern British life with a curry house on every corner . . . well not quite but there are a great many Indian restaurants serving curry which shows the British love affair with what is a cuisine rather than a dish. Before we look at the history of curry, it is important to define what curry is. These days, curry in India means a sauce or gravy. 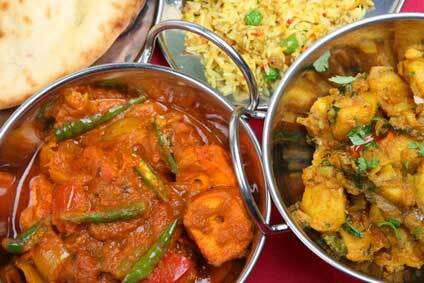 Curry in the UK is the word used to describe any type of savoury Indian food. And Indian food in the UK is the term that also includes cuisine served in restaurants that are run predominantly by the Bangladeshi / Pakistani community. Bangladesh used to be part of Pakistan up until 1971. And Pakistan became a nation split from India in 1947. So, deep down, what we know as Indian cuisine does have some of its roots from the Twentieth century stemming from India. 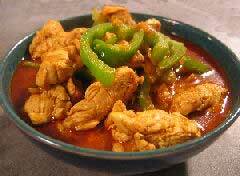 The notion of a curry is what the British during their rule in India referred to when eating spicy food. Indians in India would never have used the word curry to describe all sorts of dishes. They would use individual names reflecting the regional variations of countless curry dishes. A curry in India is a spicy stew like dish, something that has a sauce base. The British in India may have learnt the word from the Portuguese who had adopted the term from Southern India. 'Karil' is one of those South Indian words and this may have eventually become 'curry'. The British in India created their own spicy dishes which were diluted versions of original recipes that the cooks were ordered to make to suit European tastes. Another story about the origins of the word, is that it may have come from 'karahi', a wok style metal vessel in which Indian dishes are prepared. Another theory is that it came from 'kadhi' or 'khari' which is a Northern Indian yogurt based curry dish. Wherever the word comes from, it is here to stay for a while until we begin to realise that it is a too rounded and generalised a term to encompass a vast selection of many cuisines which are as diverse as the regions of the Indian sub-continent. The British love affair with curry began at the end of the Sixteenth century when the Dutch were the leaders in the trading of pepper. With their monopoly over the spice, they had hiked up the price, so the monarch granted a royal charter to a small group of merchants allowing them to create a trading company. The sole purpose of the East India Company, as it was later called, was to secure a better price for pepper than the Dutch asking price. There was never any intention for this company to build an empire. In fact, the British were not too keen on trading with India either. The country was merely perceived as a handy stopping off port and a place for the exchange of goods such as cotton and linens. However with the Dutch increasingly making trading in Indonesia more difficult, the coast of India became lined with ports that were protected by private armies consigned to keep an eye on the European traders. At that time India was ruled by emperors and Mughals who were more often than not involved in infighting. This strengthened the European stronghold and their chances of grasping control of many regions and territories of India. With the Mughals yielding to the British, the East India Company gathered momentum and power. This reign of the British Raj was the most significant and the longest in Imperial history lasting officially up until 1947. The days of the Raj were decadent and this was reflected in their cooking. Every social event paid special attention to the food and the British Memsahibs ran households that included chefs and cooks. Many of them were highly trained to cater for the western palate. Often, the grand meals would have consisted of game and poultry which was of poor quality so the cooks would often have to improvise by creating hybrid dishes such as chapatis and homemade jam. Breakfasts would consist of omelettes seasoned with spices and the simple Indian dish of rice and lentils known as kichidi turned into the British kedgeree with the addition of smoked kippers shipped from England. So from morning, noon until night, all the meals became a fusion of western and eastern cooking traditions. Just as the British in India had endeavoured to replicate home comfort cuisine, when they arrived back in Blighty, they craved a little of the East and that was 'curry'. 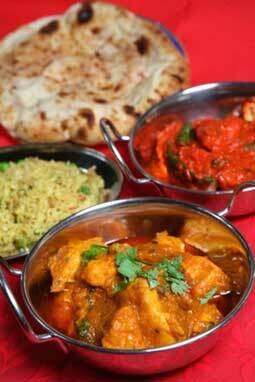 The first recorded or published recipe for curry in Britain is by a woman known as Hannah Glasse. In her 1747 book 'The Art of Cookery' which appeared in twenty editions throughout the Eighteenth and Nineteenth centuries, her initial recipe for 'currey' included the spices coriander seeds and pepper. Then by the fourth edition of the book, she added ginger and turmeric. There was no mention of chilli because the chilli fruits had only been introduced to India around the late Fifteenth Century. In 1861, 'Mrs Beeton's Book of Household Management' - a guide to running a home in Victorian Britain - printed a recipe for curry powder made with a veritable selection of spices. The first 'Curry' house in Britain was run by an ambitious man known as Dean Mahomet often spelled as Mahomed. Born in 1759 in Bihar in Eastern India, he came from a middle class Bengali Muslim family but was orphaned at just eleven years of age. With his father's army connections, the young Dean Mahomet found himself in the service of an Anglo Irish officer known as Captain Godfrey Evan Baker. As Baker rose through the military ranks, so too did the luck of Mahomet who found himself traveling with his master across India and then to Cork in Ireland. On the Emerald Isle, he became the first Indian to publish a book in English called 'The Travels of Dean Mahomet'. At the turn of the Nineteenth century, at the age of fifty with his children and his Irish wife a divorcee called Jane Daly, he shifted from Ireland and moved to London. This was where he made his mark in the culinary field. London was open to unusual tastes and if Indian food was served somewhere, it was popular. Mahomet picked up on this vibe and thus opened the Hindostanee Coffee House on No 34 George Street. There he served 'Indian' style dishes with a hookah that contained real Chilm Tobacco. The building which was the Coffee House is now known as Carlton House, but there is a green plaque in Westminster in honour of this Indian entrepreneur. For the rest of the Nineteenth century, the rise of curry took a gradual but steady pace upwards until it came to an abrupt end at the start of the First World War when food for survival in the form of rations was really the only thing on everyone's mind. After the fall of Hitler and Indian Independence in 1947, the interest in curry again picked up. Especially during the late Fifties and Sixties in Britain, Indian food was a cheap and cheerful alternative when eating out. One could buy an Indian takeaway that cost next to nothing. So, many working class poorer communities opted for Indian food. Also with more and more people from the sub-continent coming to live in the UK, there was a surge in popularity for spicy cuisine. There was an influx of people from the Indian sub-continent coming to live in the UK who were Commonwealth immigrants welcomed into Europe to deal with the labour shortages that were then faced by several industries. Many Asians brought with them the exotic flavours of home. It was during this birth of multiculturalism in Britain that post war curry became a phenomenon. It is now part of the fabric of British tradition and culture and looks like it is here to stay in some form or another, be it formica topped or fine dining. Manju Malhi was raised in North West London where she grew up surrounded by Indian culture, traditions and lifestyles. However, she spent several years of her childhood in India where she explored and experienced the vast and varied cuisines of the country. In her cooking, she draws up on her past and combines it with the realities of urban Western life and has come up with her own unique Brit-Indi style of food.